After Meier and Semjase allegedly witnessed the Apollo-Soyuz coupling during Meier’s Great Journey in space as described in Contact Report 31, which took place during July 17-22, 1975, they moved on to visit other places in the universe. They left the Earth behind and after a while they rendezvous with a huge mother ship of the Plejaren, called the Great Spacer. In PPKB 1, the description of the rendezvous with the Great Spacer is illustrated with the following pictures. These 2 pictures are a part of the collection of 42 space photos which around 2001 ‘it was strictly ensured, with the help of Ptaah, that it only concerned “Billy’s” genuine pictures or his pictures that were only slightly falsified’. The left picture shows the Great Spacer close to the planet Jupiter, the Great Red Spot of Jupiter is visible. The right picture shows the dome on top of the Great Spacer in which the command center is located. 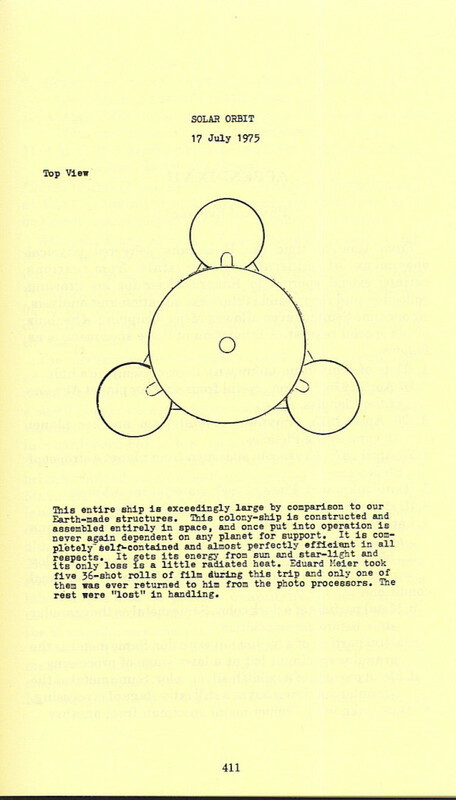 In CR 39, describing Meier’s second space journey, the above left picture is again printed. 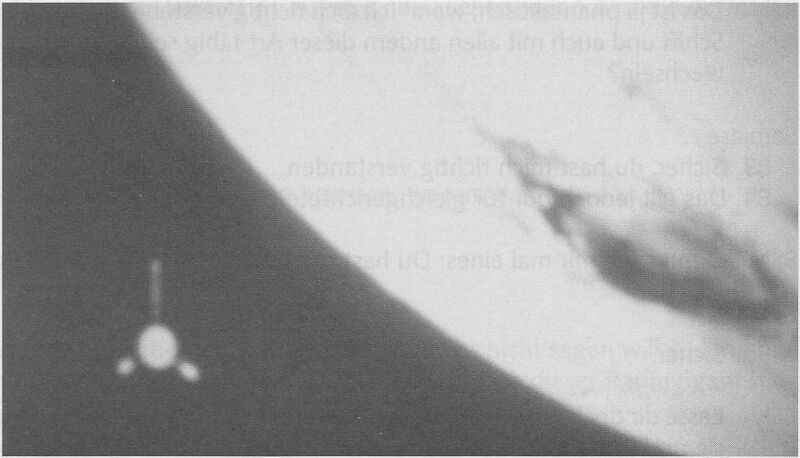 It is not entirely clear whether this picture is supposed to be from Meier’s first space journey, described in CR 31, or from his second journey described in CR 39, although the description in CR 39 seems to apply more to this picture as it mentions Meier taking pictures of Jupiter’s red spot with the Great Spacer in the background. In Contact Report 68, Friday, November 12, 1976, 0:47 AM, Meier informs Semjase that the images which are very similar to his Great Spacer – Jupiter pictures had been shown on television once or twice in the year 1976. Semjase responds by saying that those images were inspired by the impulses sent by the Plejaren to prepare the Earth human beings for certain things in the future. We have been able find 2 NASA educational documentaries from the early 1970s that indeed show animated images that are strikingly similar to Meier’s Great Spacer – Jupiter picture, although compared to Meier’s picture they are mirrored horizontally. Check at 17:15 min. in the below 1971 documentary – Exploration of the Planets. Check at 19:05 min. in the below documentary – Jupiter Odyssey – that was broadcasted in early 1970’s. What these images show is an animation of the American space probe Pioneer 10 flying by Jupiter. This probe, the purpose which was to collect data from Jupiter, was launched on March 3, 1972 and flew by Jupiter around December 1973. Below is a side-by-side comparison between Meier’s picture and a frame from the documentary ‘Exploration of the Planets‘. Especially note the striking similarity between Jupiter’s Great Red Spot on Meier’s picture and the one on the frame from the documentary. Since the animation depicts Pioneer 10 flying by Jupiter one could ask: prepare the Earth people for what? This is a depiction of one of our own craft flying by a planet we already are familiar with for centuries, not of a giant extraterrestrial spaceship. Were the impulses perhaps misinterpreted by the artists, who used it to depict Pioneer 10 instead of a giant mother ship? Then why is the design of Pioneer 10 so similar to the Great Spacer? Was that also because of intuitive input? And why is the picture they transmitted practically identical to a picture that Meier would take 4 years later? This can hardly be explained by coincidence. Did they travel to the future to see what picture Meier would take, traveled back and transmitted this picture to the artist through inspirational impulses? In the analysis of the cave-men pictures on UFO-Prophet blog, Mahesh presented detailed explanations on how absurd this strategy is. If so, why would they do that, is it really so hard for the Plejaren (who are 3,500 years ahead of us in science and technology and 30 million years ahead of us spiritually) to imagine Meier would be accused of hoaxing if exactly identical images as Meier’s pictures would be transmitted? In verses 38 and 39 of CR 68 Semjase admits that they might have made a mistake and that they didn’t expect (verse 44) such negative responses, but later in verse 46 she says that it had to happen and that there is a purpose behind it which Meier will experience it in the year 1977. We do not know what that purpose was, but we will report it as soon as we find it. In this section we will show that the details regarding the size and shape of the Great Spacer kept changing over time from publication to publication. 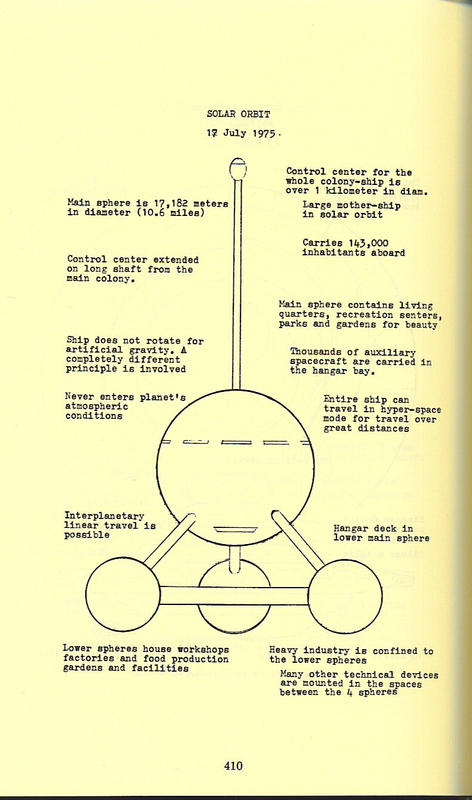 In the above Wendelle’s picture, the size of the control or command center is given as ‘over 1 km’ in diameter while in the Contact Report 31 from his own Messages from the Pleiades, Vol 1 (pg. 302) book, it is given as ‘several kilometers in diameter‘. Also the main sphere is given as 17,182 meters in diameter. On page 131 of Wendell’s ‘UFO Contact From The Pleiades: A Supplementary Investigative Report published in 1989, Wendelle states that the size of the smaller, auxiliary spheres was nearly 4 miles or 6.4 kms in diameter. Wendelle didn’t cite the source of this information but one likely explanation is that he got this information from Meier who might have also shared other details like the length of the bridges, etc. with him. The below image is a ‘recent version‘ of the Great Spacer that was made for the Billyforkids website which according to its description is unofficial and supported by Meier. This website is also listed on the FIGU website under the section ‘Links – Unofficial web sites of FIGU supporters, friends and organisations’. This seems to suggest that these images are based on the data given by Meier. We could be wrong, so keep this in mind when reading further. 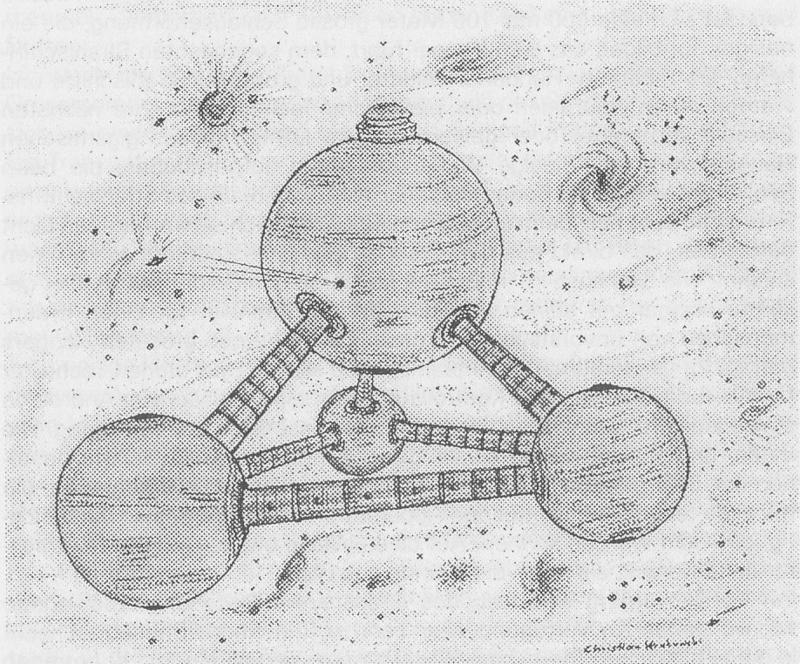 One thing that is obvious from this recent drawing of Great Spacer and also from Billy Meier Wiki (which is also listed on the FIGU website) is the shape of the main central object which is given as oval or egg-shaped however in Wendelle’s and Hans George’ 2003 article, the shape was given as spherical which is contradictory. Also in ‘Billyforkids’ website, the size of the top command center is given as 1 km in diameter which is different to the information from Contact Report 31 which states that it is “several kilometers in diameter” but is close to the Hans George’ 2003 article which states that it has a diameter of “more than one kilometer“. Also in ‘Billyforkids’ website, the total length of the Great Spacer is given as 17 kms while earlier it was given as 35 kms in the 2003 article. All of the above illustrations not only show ‘bridges’ between the big sphere and the three smaller spheres, but also among the three smaller spheres. 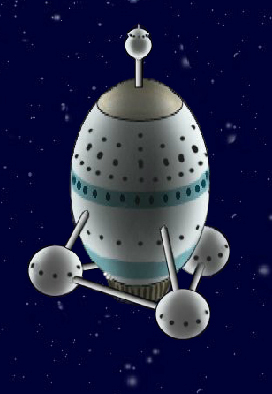 Regarding the illustration in ‘Billyforkids’ website, one can notice that there is new grey circular structure under the base of the main sphere. We are not sure if it is based on Meier’s data or just the artist’s own creativity as this structure is not present in Wendelle’ and Christian Krukowski’ drawing. So we contacted the author of the ‘Billyforkids’ website on Dec 30, 2014 who informed us on the same day that the design was “reviewed and approved” by the FIGU Core Group member and also the Director of SSSC, Chrisitian Frehner. If Meier really had photographed the Great Spacer, then from the perspective we have in Meier’s photo, we should be able to see the third sphere under the main sphere, though it depends on which design – Wendelle’s or Christian Krukowski’s or Billyforkids website – is accurate. However the bridge connecting the left and right spheres (refer to the front view of Great Spacer drawing in pg. 410 above) should be visible in all designs, but none of these features are visible on Meier’s photo, just like on the frame from the animation of Pioneer 10 which has just three-rod trusses (120 degrees apart) and no structure joining them. It is very strange that Meier was unable to distinguish between the Plejaren mother ship and the Pioneer 10 spacecraft. It’s even stranger that the alleged Plejaren were even unable to distinguish their own mother ship from an Earth spacecraft. Note: Thanks to Miroslav Stanko who first brought the missing sphere issue to our attention, which prompted us to dig deeper into this issue. Whatever it is, the reasoning and the explanations given so far seem improbable and absurd considering that the alternative explanation that this picture simply was taken from one of the documentaries from the early 1970’s is backed up by strong, unambiguous evidence. Given the fact that the picture of the Great Spacer and Jupiter clearly seems to be from a documentary film from the early 1970’s, this also calls the authenticity of the picture of the dome of the Great Spacer into question. 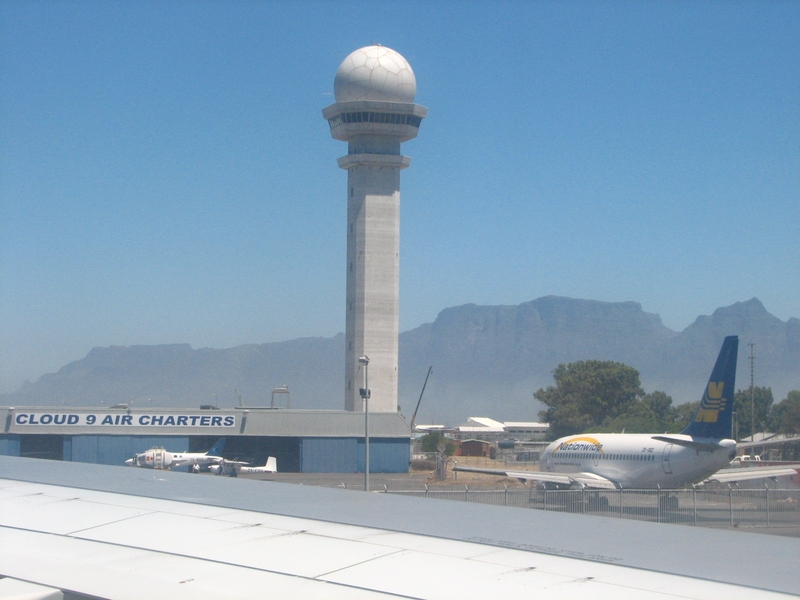 This picture seems to resemble an air traffic control tower with a radar dome, similar to below picture, however we have not been find an identical structure (yet). Of course it is practically impossible to prove this is an authentic picture of a giant alien spacecraft, but technically speaking, until an alternative source for the picture is found this also cannot be disproved. 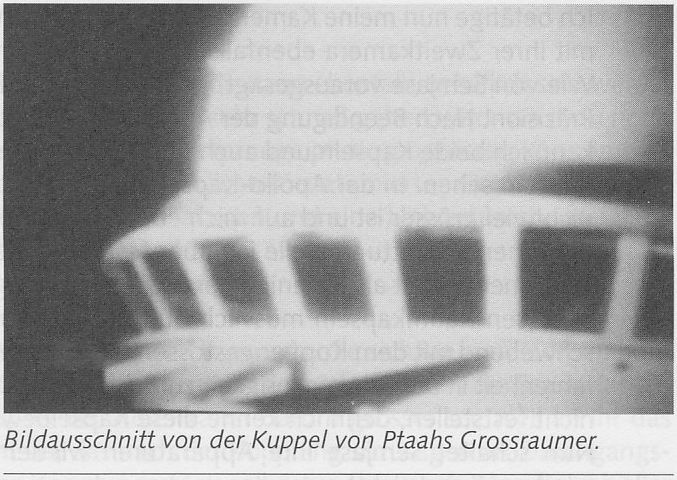 We have investigated two of Meier’s pictures which allegedly show the Plejaren mother-ship called the Great Spacer in the vicinity of Jupiter, and a close-up of the dome of this ship. The Great Spacer – Jupiter picture turned out to be practically identical to a frame from NASA space documentaries from the early 1970s, which shows an animation of the Pioneer 10 probe flying by Jupiter. The explanation by FIGU that the artist was inspired with a similar or identical picture as Meier would take 4 years later to make the Earth people familiar with certain concepts seems very improbable and is filled with absurdities and contradictions. The picture which supposedly shows the dome of the Great Spacer seems to resemble an air traffic control tower, however we have not found any identical structure (yet). Though it is practically impossible to prove this picture is an authentic picture of a giant alien spacecraft, it also cannot be proven to be not authentic unless an alternative source is found.